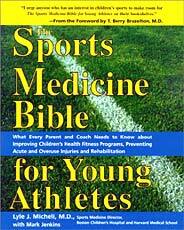 [JUNE 12, 2002] "The Sports Medicine Bible for Young Athletes." Lyle J. Micheli, M.D., with Mark Jenkins, Sourcebooks, Inc., 2001, 252 pages. Every year thousands of children across America are injured while participating in sporting activities. In the new book "The Sports Medicine Bible for Young Athletes," authors Lyle Micheli and Mark Jenkins provide important information that parents can use to "make their children’s sports experiences safe, successful, and wholesome." In the book’s preface, Dr. Micheli writes, "Although a recent study showed that 90 percent of parents want their children to participate in sports, many parents express concern about the potential for physical and psychological harm in organized sports programs." The research and expertise of Dr. Micheli and others in this field has resulted in significant advances in the prevention and treatment of sports injuries. The book is divided into two sections, "What Every Parent, Player, and Coach Needs to Know about Youth Sports" and "Sports Clinics." Part one is a detailed examination of the subject of injury prevention and treatment; part two discusses specific parts of the human body, the injuries they can sustain and the treatment options. There are many advantages and disadvantages to participating in sporting activities. Encouraging good fitness and heath, developing sports and motor skills, building self-esteem and a competitive spirit, pleasure, and friendship are some of the advantages. The No. 1 risk involves inadequately trained coaches. According to the authors the United States is the only industrialized country in the sporting world that does not have a national coaching education program. Injuries are a certainty in sports, and the authors discuss the preventative measures every child should take during participation. They also explain how to prevent injury in the most popular sports: soccer, skating, basketball, baseball and football. One of the most important aspects of involvement in sports is physical fitness. How to achieve and benefit from health fitness are two components essential to better performance. There are programs that can improve a child’s fitness through the cardiovascular system, muscular-skeletal system and nutritional habits. Nutrition is especially important to encourage the normal growth and development of a child and to supply the energy necessary for physical exertion. A proper balance between fats, carbohydrates, proteins, fluids, minerals and vitamins must be achieved. Regardless of a young athlete’s physical condition, the inability to cope with the stress of competition can lead to a child’s withdrawal from organized sports. According to the authors stress can result from insufficient playing time, abusive coaches, an overemphasis on winning, fear of failure, and mismatching of size and skill levels. Other important topics that parents must consider include the effects of strength training on young bodies, meeting the needs of athletes suffering from a chronic illness or disability, and how to recognize the growing problem of substance abuse in athletes, particularly for enhancing performance. Each section contains a discussion of potential injuries and includes symptoms, causes, self-treatment, what the doctor should do, surgical options, rehabilitation and recovery. "The Sports Medicine Bible for Young Athletes" is a complete guide and first source for information on the health and fitness of young athletes. In the preface, Dr. Micheli writes, "This book describes measures parents and coaches can take to improve youth sports. … I hope this book helps you provide children with a sports experience they will take with them into adulthood — along with a lifetime interest in health fitness." This book is highly recommended for parents of young athletes or anyone who has any association with youth sports. [JUNE 5, 2002] The Lincoln Community Theatre box office opened for the summer season on Monday, June 3. Season ticket holders may begin making reservations for any of the three summer productions by calling 735-2614 or visiting the box office from 11 a.m. to 2 p.m. Monday through Saturday. The box office is located in the lobby of the Johnston Center for the Performing Arts on the campus of Lincoln College. General admission tickets for performances are offered one week before the opening of each show, at $9 for adults and $6 for students through eighth grade. The first production of the season, "Hello, Dolly!" opens on Friday, June 14. Season tickets for the summer, which include the June musical production of "Hello, Dolly!" the July comedy "Dearly Departed" and the August musical production of "The King and I" are still available. Send check or money order ($20 for adult; $12 for children through eighth grade) to LCT, Box 374, Lincoln 62656. For more information on season membership, call (217) 732-4763 or (217) 732-2640 or visit the LCT website, http://www.geocities.com/lincolncommunitytheatre. Lincoln Community Theatre has chosen cast members for the local June 14-22 production of "Hello, Dolly!" Cast as the ever-meddling Dolly Levi is Jill Nessler of Sherman, who has previously appeared on the Lincoln stage as Miss Hannigan in LCT’s summer 2000 production of "Annie" and as Lucy in last summer’s opening show, "You’re a Good Man Charlie Brown." The role of millionaire Horace Vandergelder will be played by Roger Boss of Lincoln. Boss has appeared in numerous LCT productions, most recently as part of the barbershop quartet featured throughout the 1999 production of "The Music Man." Other players featured in this June production are Marilyn Willmert of Lincoln as Mrs. Malloy, Deb VanDeVoort of Springfield as Minnie Fae, Andy VanDeVoort of Springfield as Cornelius, Kyle Pepperell of New Holland as Barnaby, Josh Twente of Lincoln as Ambrose, Alison Maske of Mount Pulaski as Ermengarde, Brian Welter of Lincoln as the policeman/judge, and Nancy Schaub of Lincoln as Mrs. Rose. Chorus members include Tina Mayer and Brian Willmert of Lincoln, Ann Opferman of Petersburg, and Abby and Heidi VanDeVoort of Springfield. The play is directed by Dan Bailey of Lincoln, who will also design and oversee construction of the set. Jan Mikelson of Hartsburg will serve as accompanist; Jeff Kindred of Atlanta will direct vocals; and Miranda Stone of Lincoln will serve as light and sound director. All performances are at Johnston Center for the Performing Arts on the campus of Lincoln College and are at 8 p.m. with the exception of the Sunday, June 16, performance, which is a 2 p.m. matinee. Lincoln Community Theatre’s website is at www.geocities.com/lincolncommunitytheatre/index.html. Pictures from past productions are included. The LCT mailing address is Lincoln Community Theatre, P.O. Box 374, Lincoln, IL 62656. E-mail: lincolncommunitytheatre@yahoo.com.